This real stone is a flexible, lightweight, approximately 1/8" thick tile backsplash product that offers the DIY homeowner a thin-cut stone option for a fraction of the price of its designer counterpart. Simple peel and stick installation eliminates the need for mortar or grout, and no contractor is necessary. Aspect Stone backsplash tiles are available in a variety of earth-tone natural colors providing endless options for your kitchen backsplash ideas. For the best kitchen backsplash self adhesive application we recommend priming the wall prior to installation. These backsplash panels can be treated with a stone sealer or impregnator to provide protection in high use areas. Aspect Trims are also available to complete your kitchen backsplash peel and stick project. Aspect Stone is made by starting with a 24 to 36-inch thick slab of natural quarried sedimentary stone. The exposed face is chiseled and cleaned so the remaining surface is smooth, level and the natural "pores" of the stone have been opened. A proprietary resin liquid is applied to the exposed face and soaks into the stone. After the resin has cured and dried, the application is repeated a number of times in combination with an application of a fiberglass mesh. After the final cure period, the resin and fiberglass mesh form a secure bond with the stone. A skilled stone craftsman then fractures and peels a 1/16-inch thick layer away from the large slab, yielding a thin section of bonded real stone. Using highly accurate automated saws, the layers are cut into various ledge stone sizes and the individual thin pieces are hand applied to a peel and stick foam adhesive. 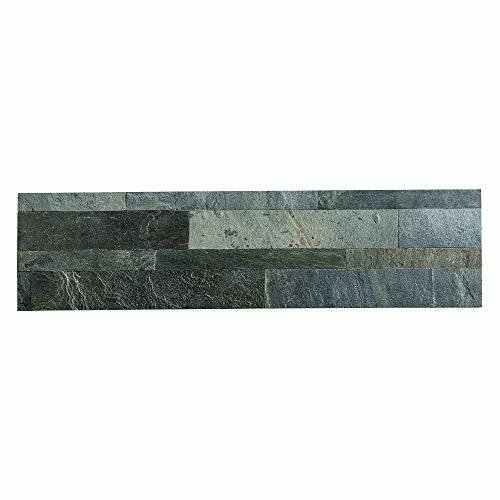 The ledge stone pattern is cut one last time to ensure it is accurate, level and square, to yield the all-natural 6-inch x 24-inch ledge stone panel. The thin layer of the sedimentary stone, cured resin backer and peel and stick foam adhesive combined make a beautiful, real stone product which is flexible yet can be cut with simple shears. If you have any questions about this product by Aspect, contact us by completing and submitting the form below. If you are looking for a specif part number, please include it with your message.